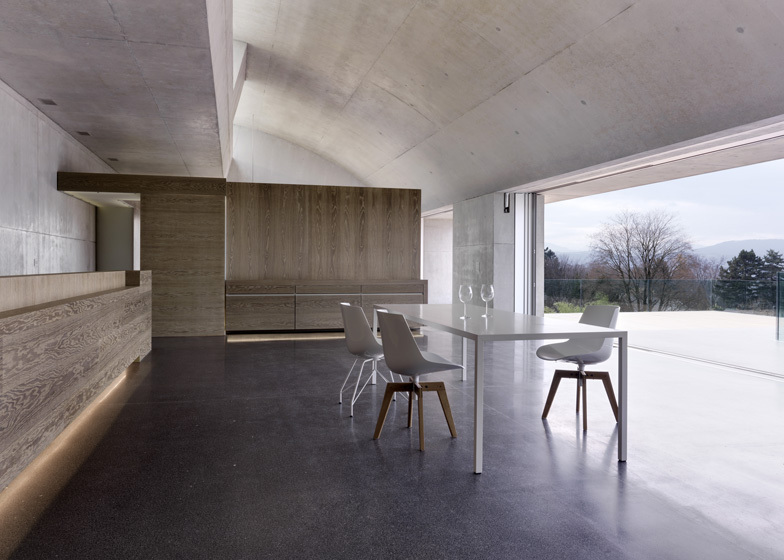 Swiss architect Gus Wüstemann used raw concrete, oak and travertine to create the smooth walls and floors of this home and poolhouse overlooking Lake Zurich (+ slideshow). "The use of raw materials is essential for our work," Wüstemann told Dezeen. "It's that kind of atmosphere we're looking for - authentic surfaces with character." 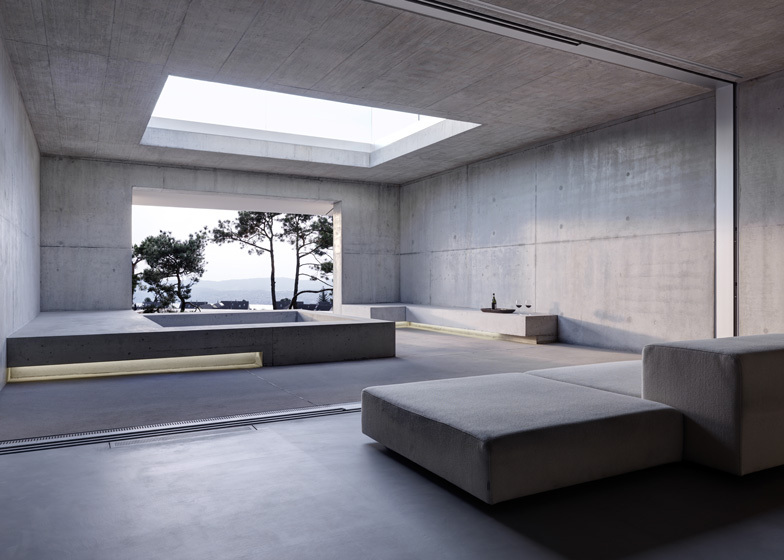 Describing the concrete structure of the house, he said: "It's about mass and feeling the power. 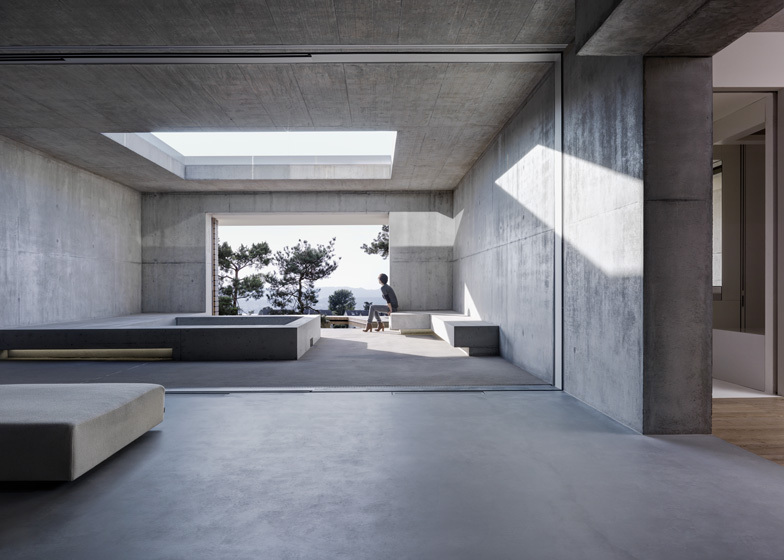 Concrete is a further step in the culture of stony architecture, but it's still a stone and you can feel all the work of the construction behind it." 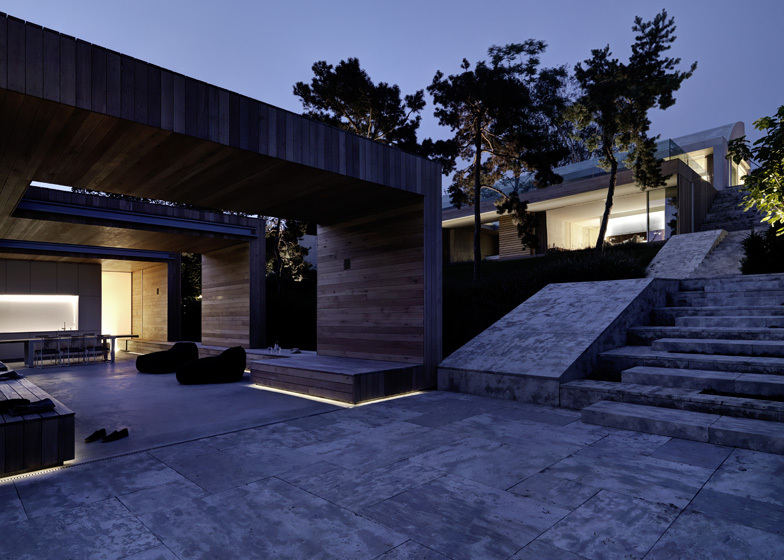 The two buildings are positioned at different levels of a sloping site, with the swimming pool and pavilion at the lowest level, while the house sits above on the other side of a small garden. 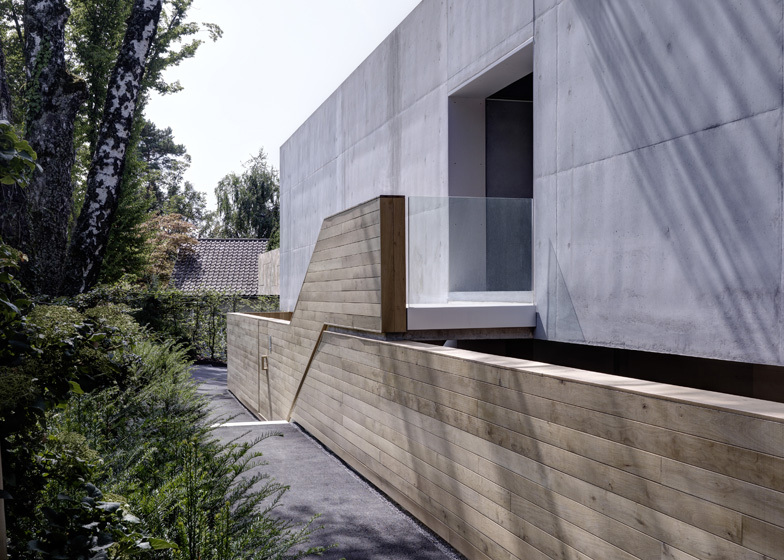 Concrete dominates the walls of the house, but the facade is clad with timber to match the pavilion opposite, which is solely clad with wooden panels. 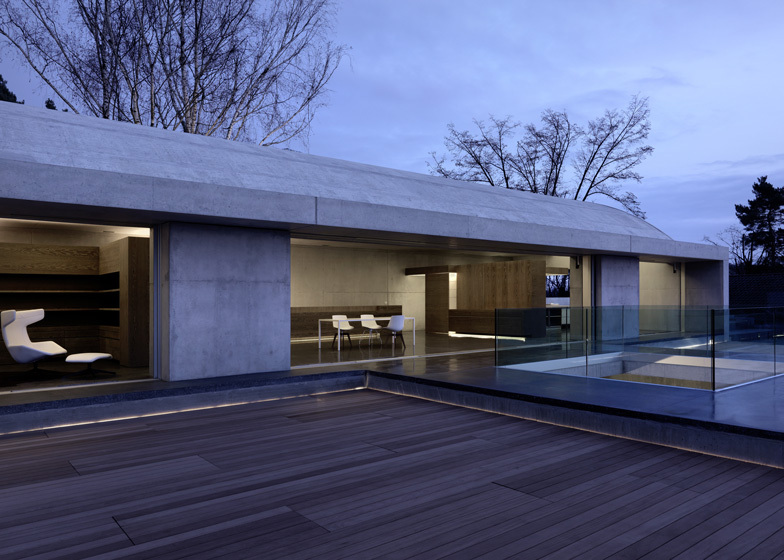 Frameless walls of glass slide open across the facade of the house, connecting living rooms on the ground and first floors with a terrace and balcony that overlook the lake. Bedrooms are located on the ground floor, while a movie room, gym and wine cellar are housed in the basement. We've featured a few projects by Gus Wüstemann, most of which also feature raw materials - see them all here. 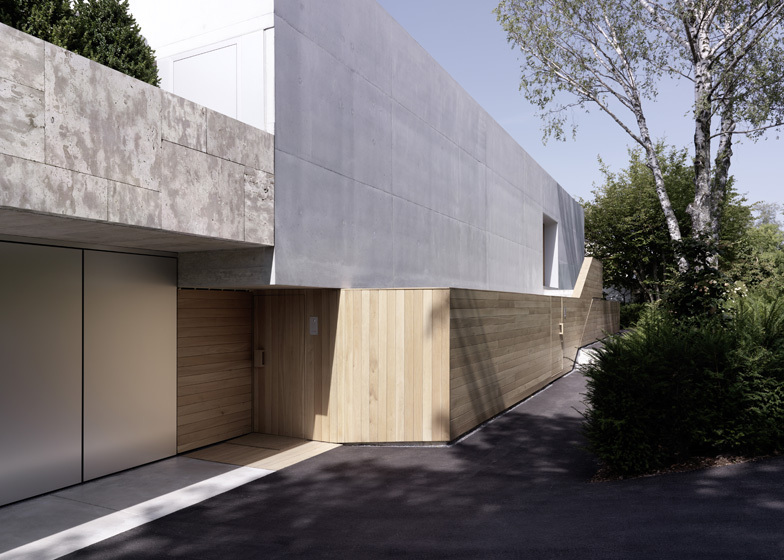 Other Swiss houses we've featured include a holiday home in the Alps and a concrete house with folded seams. 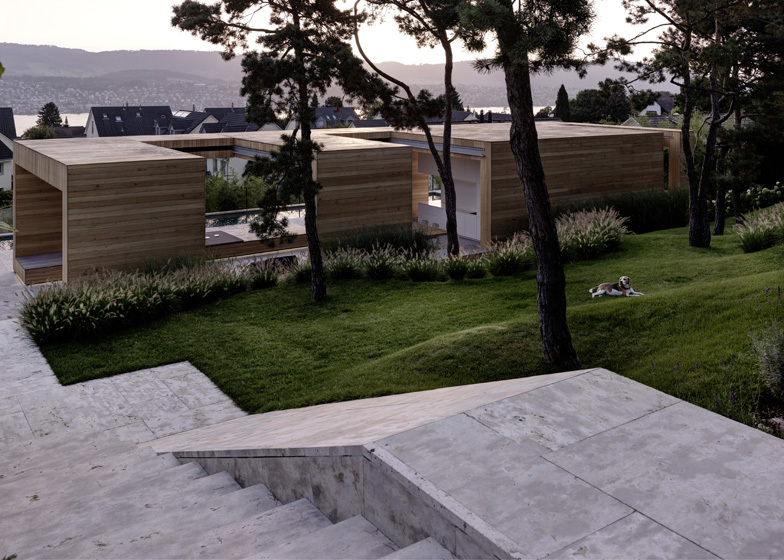 This is a house for a young South African family in Erlenbach, just outside Zurich along the lake. The plot is in a suburban context and therefor pretty dense with family homes, typical for the area. The site is on a slope, where on top there are beautiful views to the lake with evening sun and at the lower part there is a group of smaller family houses. The clients asked us for a solution for a house that made the most of the big plot, wanting a view, but not end up with a house on top of the hill and a rest of a garden down below. 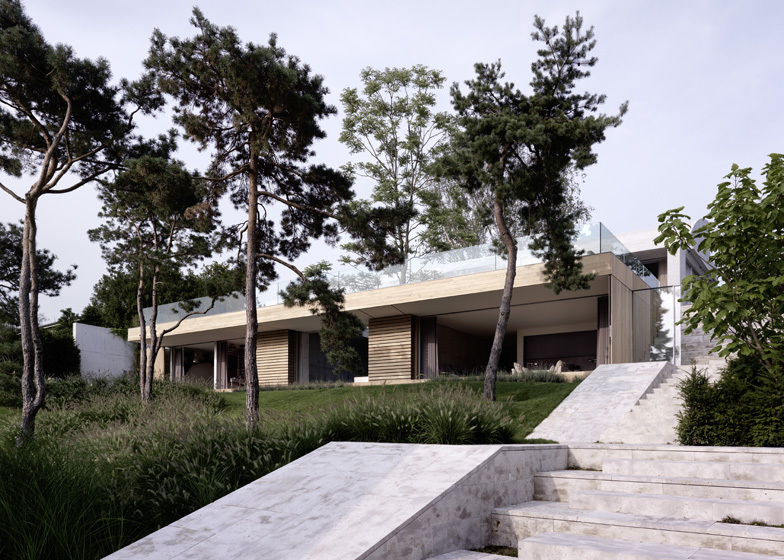 Our solution for this plot was to occupy the periphery of the site, with the main house on top of the hill and the pool house at the bottom, both houses connected through a solid stony promenade: 2 verandas. By occupying the periphery: there is one veranda at the top, the promenade is going alongside the eastern boarder of the plot leading to the south end, there is a park in the middle of the site. The park can be consumed as nature from all three sides and therefor there is no 'left over' land. The stony promenade connects the two verandas, is a site of its own, where you walk or sit and enjoy the view to the lake or the park. 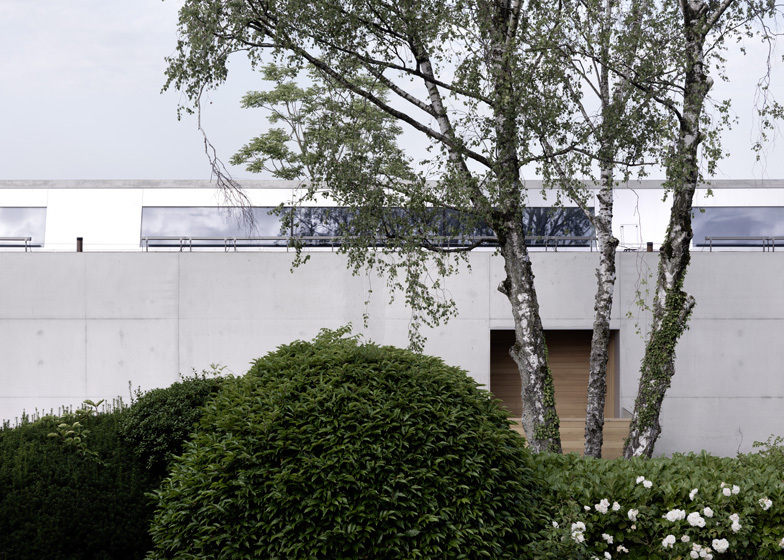 With the promenade, the garden moves up to the level of the living room and it connects all levels of the house with the garden. 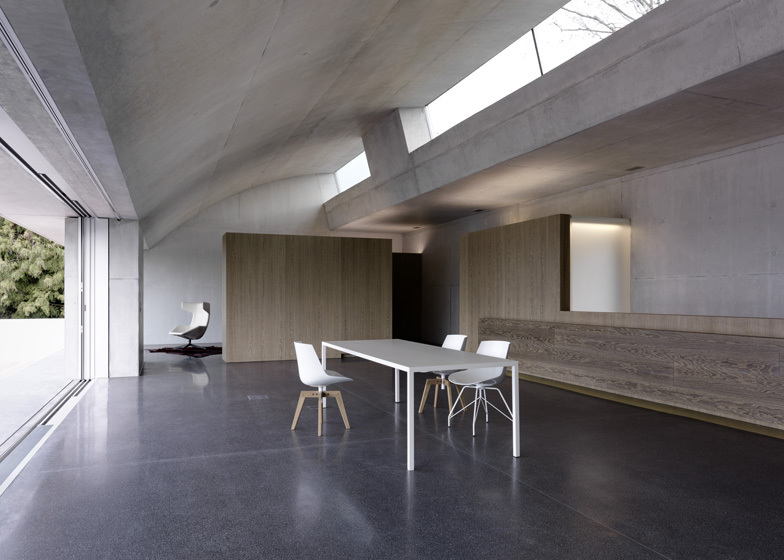 The main house is a stony, concrete, hammer shaped volume over two levels, that contains the living rooms. 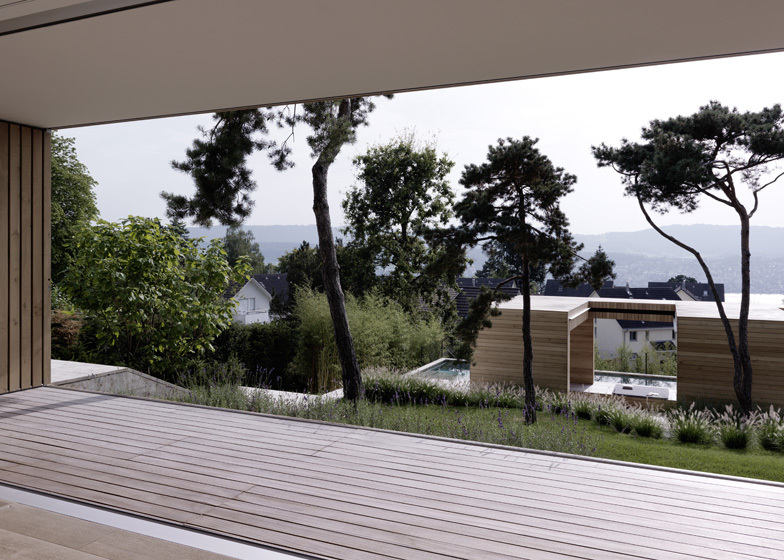 In the upper part is the‚ public 'living room for invitations and dining with a beautiful view over the lake of Zurich. On the ground level is the family lounge with an exterior patio that can be joined as one room with the living room. All the windows disappear and the inside and outside patio become one. That patio connects all bedrooms and is a lounge to sit together privately and watch a movie. The circulations in and out of that space are controlled by concrete volumes at the ceiling that condense the space through mass and light and slow the circulation. 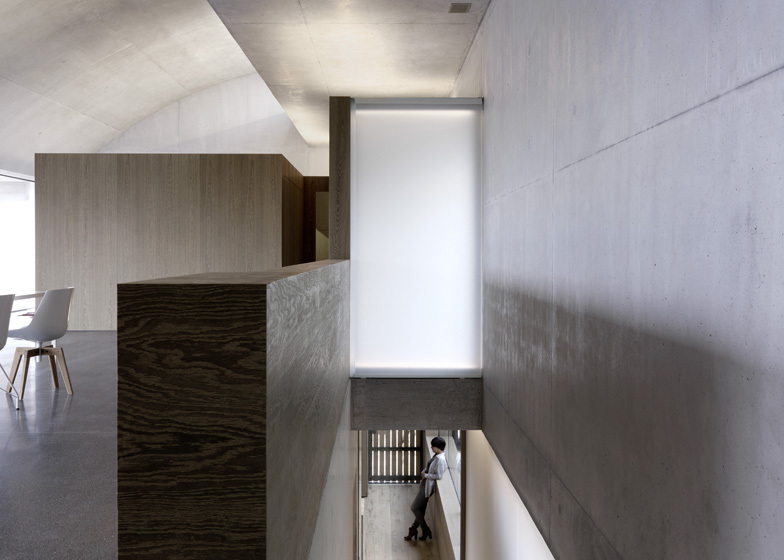 The two rooms are crossed above each other, at the ground floor level we pull a wooden curtain around the concrete volume to create the private sleeping quarters. The upper living room has a shark fin like shape, so the space is very high at the back of the space with northern sky lights, and is lower at the front to frame the view. The inside and the outside are joined, as we let all the windows disappear, so there is only the concrete mass left. 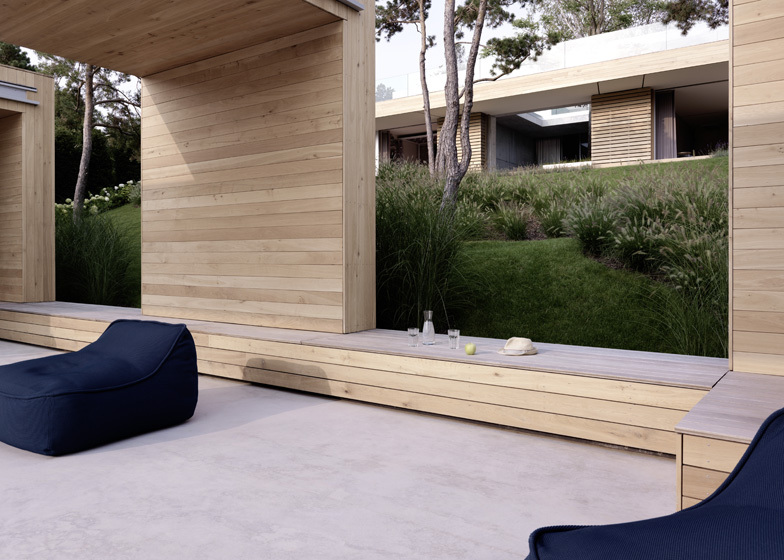 The inside becomes a covered outside space: Mediterranean feeling in the northern hemisphere. The absence of the window is the essential instrument to actually unite in and outside space; it is the glass itself that reminds us of the border of in and outside. 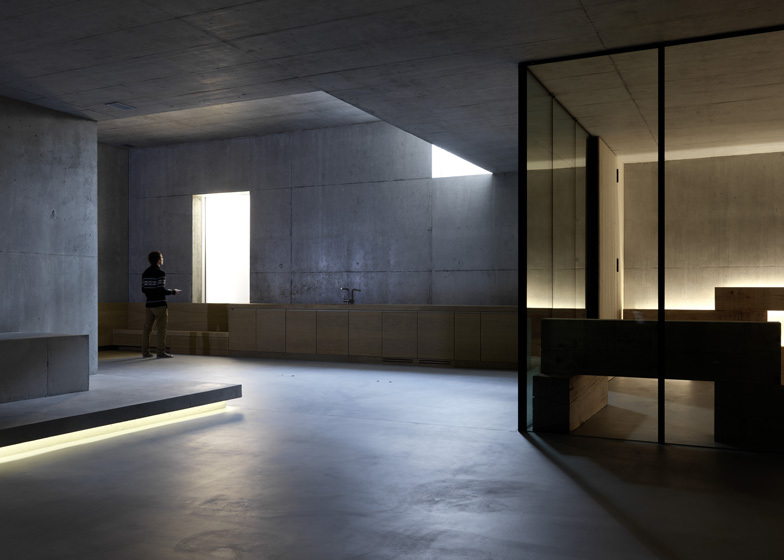 In many projects nowadays this fact is neglected or simply ignored and therefore glass is used in an extensive way. 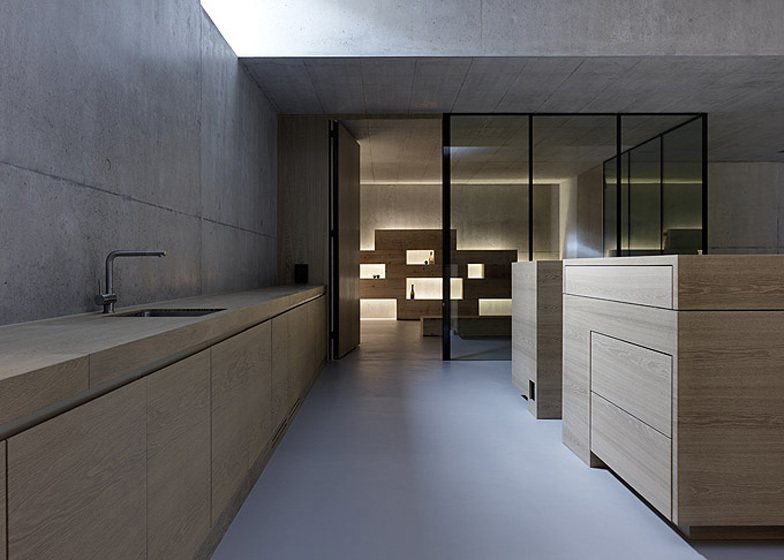 We chose natural and raw materials like concrete, travertine or wood. 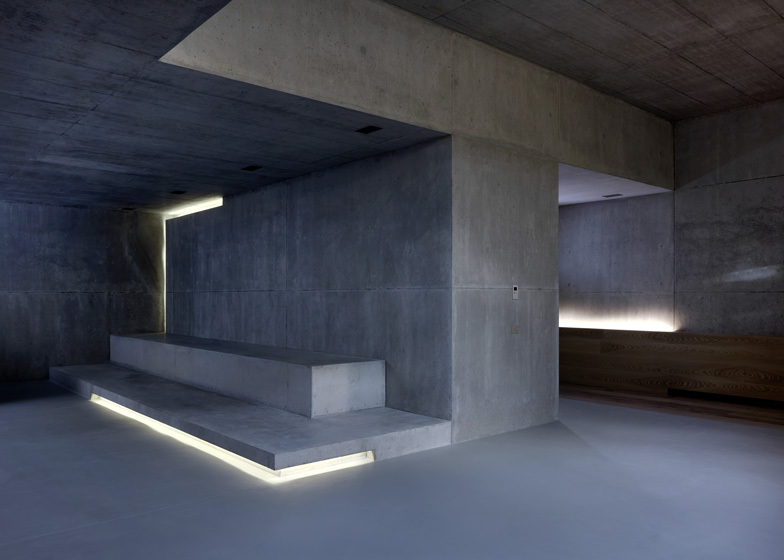 The concrete is formed and communicates with the space through light gaps that give that extra feeling of finesse to the shear mass of the concrete. 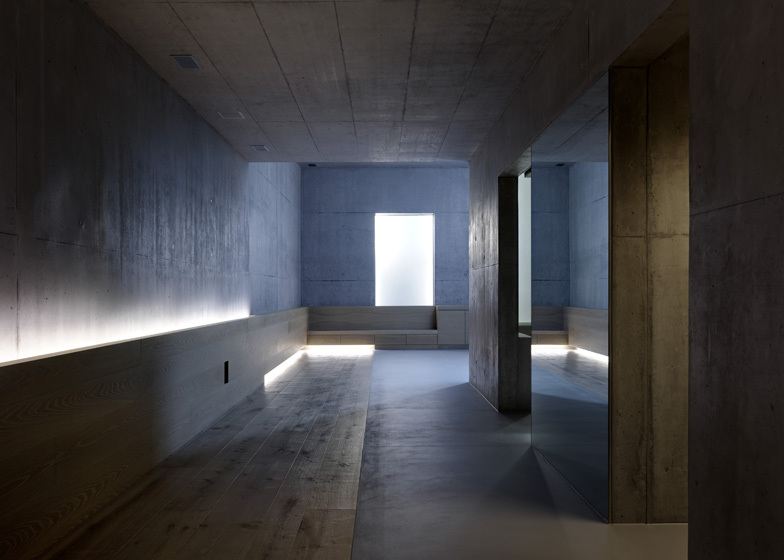 Throughout the whole house indirect lights are giving directions, and attract the periphery of the spaces rather than the centre. The indirect light is creating the atmosphere. 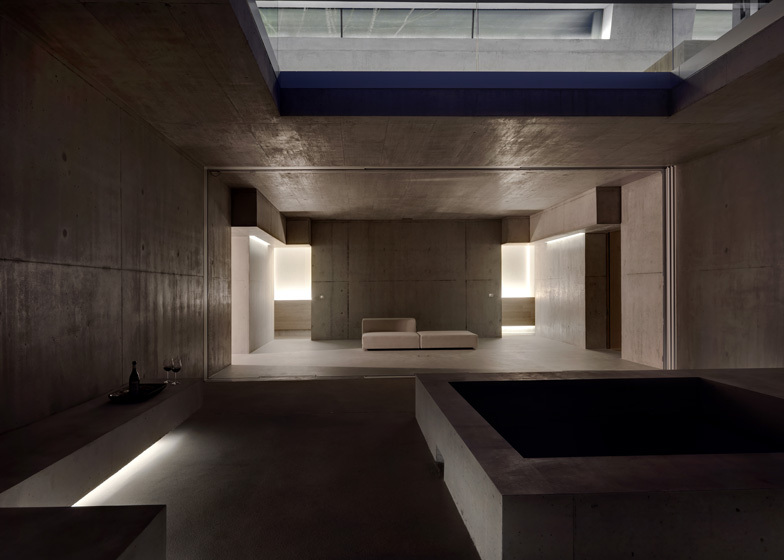 On the underground floor there is a gym, a movie room and wine cellar all arranged around the light up masses of the concrete that give the house a whole different playful area. 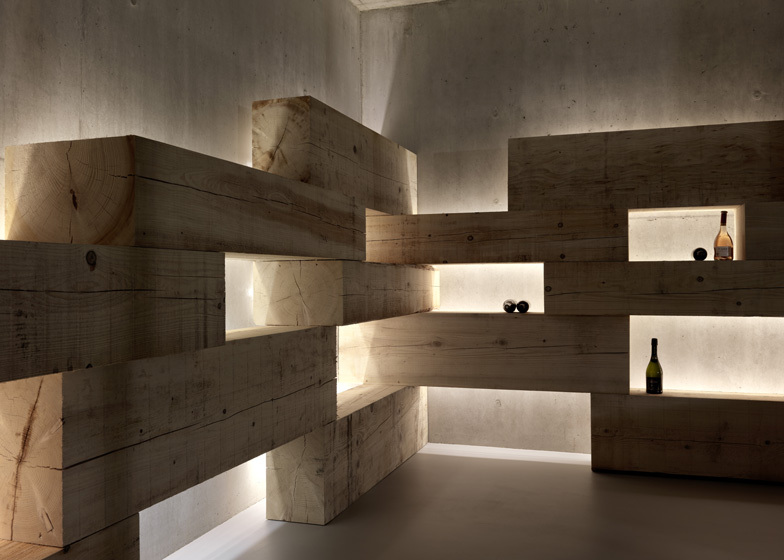 There is raw concrete and raw wood and therefore a lot of texture.